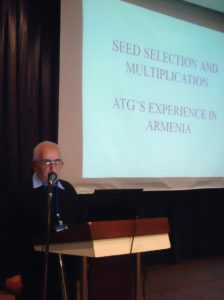 Since its inception, ATG staff and extension agents have participated in numerous international conferences and seminars to learn and share her knowledge with the Armenian farmers in general, and grain growers in particular. These meeting were co-organized by CIMMYT/ ICARDA, FAO, IFAD and others. They had taken place in countries such as Egypt, Georgia, Kazakhstan, Mexico, Russia, and Turkey. The latest such meeting took place in 2013. At the request of the Armenian Government, Gagik Mkrtchyan, ATG-Foundation Director in Armenia, represented the Republic of Armenia at an agricultural conference that took place in Almaty, Kazakhstan. The conference was organized by the UN-FAO, ICARDA and CIMMYT. Representatives from the Commonwealth of Independent States (CIS), including the Central Asian and the Caucasus Republics of Azerbaijan, Georgia and Turkey were also present. Mr. Mkrtchyan was one of the keynote speakers at the conference. 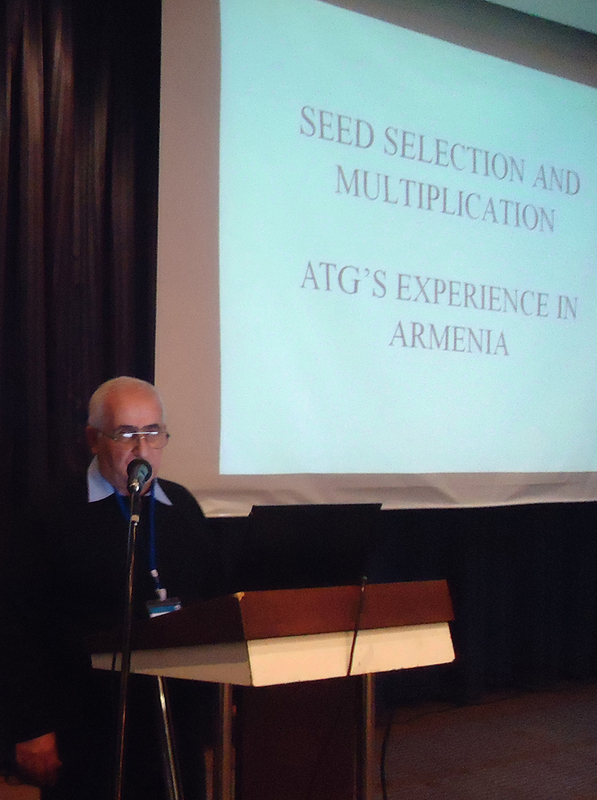 His presentation was about private sector seed development and he spoke, particularly, about the efforts of ATG in Armenia. Mr. Mkrtchyan explained steps that ATG had taken to transform its seed multiplication program from a donor-founded project to a self-supporting and self-sustaining entity. Due to the rising prices of fuel, water and fertilizers, farming — particularly, wheat growing in Armenia — was on the verge of becoming unprofitable. Mr. Mkrtchyan pointed out, how Armenian grain growers are evolving in the use of their methods and how they are developing conservation agriculture by utilizing No-Till planting technology. In this way, they managed to reduce operating costs, improve yield and increase profit margins. They met their objective, which was to reverse a negative trend and make grain growing profitable again. In 2003, with funding provided by the USAID, a team of experts form ATG traveled to Contrail Asian country of Tajikistan. Our team spend five weeks to meet with local officials, experts and farmers, and based on our knowledge and experience in Armenia, prepared a comprehensive private sector Seed Industry Program for the Country of Tajikistan. The cultural practices of Armenia and Tajikistan were very similar to each other. The idea of being involved in Central Asia was to expend marketing and consulting potentials of the Armenian agronomists, within the framework of a free market economy.